It’s no secret that I am a HUGE fan of Los Angeles based PALETA Farm to Table Meal Delivery Service, and if I could afford it, I would eat Chef Kelly’s inspired tasty and healthy eats everyday. 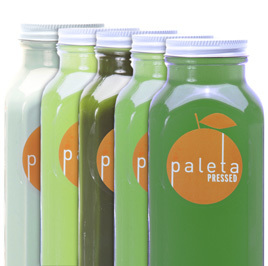 And PALETA’s fresh pressed juices are pretty spectacular, and when I heard they were offering an All Green Juice Sampler in honor of Earth Day, I just had to try it! And probably the best thing about the Green Sampler Pack is that for each pack purchased, PALETA will plant a tree on your behalf through their partnership with the Earth Day Network’s Canopy Project. So not only are you doing something good for your body, but you are taking care of our planet too! I really enjoyed this all green juice sampler. The juices were tasty, refreshing, satisfying and energizing. I drank two a day over the course of three days and sipped them in place of a meal or as a rejuvenating snack. While all the juices were tasty, my favorite was the Green Dream because it had the perfect balance of good for you ingredients and a yummy refreshing flavor that appealed to my palate. CHEERS to making Greener Choices in Honor of Earth Day! Disclosure: PALETA sent me their Green Juice Sampler for editorial consideration but all opinions and green musings are my own.